If caffeine is the only thing that's going to get you through last-minute shopping and whatever other pre-Christmas errands you still have to cross off the list, today is a good day. That's because Starbucks is running a particularly great "happy hour" deal on Thursday, where you can get any grande sized hot, iced, or blended holiday beverage for just $3. 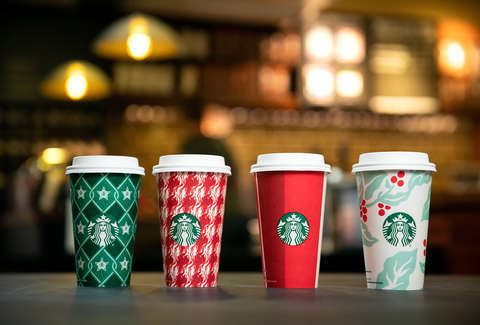 Starbucks' latest offer in its popular happy hour program kicks off at 3pm on Thursday, December 20, at which point you can drop by any location nationwide and grab any beverage from its holiday drink lineup for a cool $3. That means everything from Peppermint Mochas and Juniper Lattes to Eggnog Lattes and Pumpkin Spice Lattes are up for grabs for a few bucks cheaper than usual. Even better, you can get any of the qualifying beverages hot, iced, or blended. The only restriction is that they must be size grande (that's a medium for you 'bucks novices). So how do you get in on this? You just need to sign up to receive Starbucks' happy hour emails, and you'll be sent a promo code to present to the barista. If you're already a Starbucks Rewards member you'll automatically receive a barcode to get your $3 drink. Unfortunately, the deal doesn't apply to hot or iced brewed coffee, pre-packaged beverages, or Starbucks Reserve drinks. Still, it's a pretty big deal that Starbucks is running a happy hour deal that includes Frappuccinos. It's also worth nothing that the deal is good for just one drink per customer, so you may want to time your visit accordingly to make sure your discounted dose of caffeine will last you through the end of your errands.